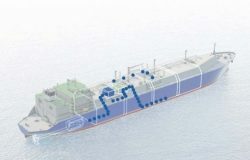 Burckhardt Compression, a global manufacturer of reciprocating compressor systems, is outfitting a 30,000 m3 LNG carrier operated by Knutsen OAS Shipping AS with Laby® compressors. They form an integral component of the onboard Wärtsilä dual-fuel system. The compressors will be delivered to Hyundai Mipo Dockyard as part of the fuel gas supply system built by Wärtsilä Oil & Gas Solutions and will supply the LNG carrier’s WinGD X-DF 2-stroke, dual-fuel engine with LNG boil-off gas as fuel.